A colour photograph of Brock Street looking south towards Dundas Street. In this photograph a portion of the Brock Theatre sign can be seen on the left and the old Ontario Bank building can be seen on the right. The Brock Theatre was located at 129 Brock Street North. It was built by William G. Goodman and John G. Strathy in 1937/8. The theatre opened April 7, 1938. The Ontario Bank building was constructed in 1867/68 by Chester Draper, with George Cormack of Whitby as architect. The bank closed circa 1890 and it became Edmund Stephenson's telegraph and ticket office. It served as apartments for many years and was renovated and restored by Charles and Ron Schaaf in 1989. 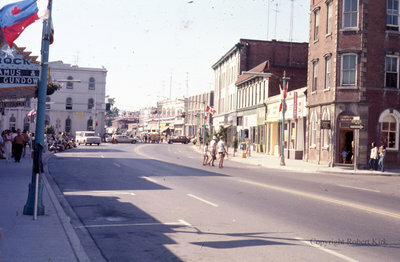 Brock Street North, c.1970, Robert Kirk. Whitby Archives D2013_011_015.